Looking for high-yield dividend stocks this month? Consider our top picks Covanta Holding Corporation, Sibanye Gold, and Brookfield Property Partners. High-yield dividend stocks are favorites among income investors, but not all dividend stocks are created equal. As yield and stock price are inversely related, chasing high yields could trap you if the stock's falling because of deteriorating growth prospects or troubles within the company. What you need is rock solid companies with strong growth catalysts that can support high dividends and yields going forward. Our contributors have identified three such safe high-yield dividend stocks to buy: waste management company Covanta Holding Corporation (NYSE:CVA), gold miner Sibanye Gold (NYSE:SBGL), and real estate play Brookfield Property Partners (NASDAQ:BPY). Daniel Miller (Covanta Holding Corporation): Covanta Holding Corporation has underwhelmed investors hoping for a rising stock price over the past half-decade, but the company appears poised to breakthrough over the next couple of years, and pays a 6.5% dividend yield. First things first, if you're unfamiliar with the company, Covanta is one of the largest waste-to-energy operators worldwide and is paid to take waste from cities, incinerate the waste and turn it into energy and metals, which it then sells. Few companies are paid to take the fuel that generates energy and other high-margin side-products, which makes Covanta's business model unique. That helps Covanta generate adjusted EBITDA margins around 25% and free cash flow conversion of about 40%. Right now its operations are primarily concentrated in the Northeast U.S., due to attractive and densely populated markets that help keep transport costs lower and provides high demand points to sell its electricity. In fact, one huge win was when New York City awarded Covanta its contract for waste incineration. While that's a big win, it's possible NYC's decision could be the first domino to fall and lead to more major cities choosing to incinerate trash rather than use landfills. In addition to NYC's contract, Covanta's growth story comes from abroad where it's currently 75% complete constructing its Dublin Energy-From-Waste facility. Dublin should be online and operating in 2018, which would be a major boost to business. And while Covanta's growth story will take a couple years to get going, the company dishes out a quarterly $0.25 dividend for a yield of about 6.5%, and that's enticing enough for income investors to take a second-look. Sean Williams (Sibanye Gold): I'm going to speak to the risk-takers out there with this selection, but a high-yield stock that I'd suggest taking a closer look at in January is African gold miner Sibanye Gold. Three issues have creamed Sibanye since the summer, causing its share price to fall by nearly 70% over that time frame. First, gold prices have been walloped since the election as interest rates have risen and the dollar has strengthened. Both actions work against gold prices, which could mean lower margins for Sibanye. Second, African miners typically have higher labor costs and a greater propensity for political disruption, so they're more likely to be hit by a drop in physical gold prices. Finally, Sibanye Gold announced a $2.2 billion deal two weeks ago to acquire platinum group metal miner Stillwater Mining (NYSE:SWC). Some pundits worry about the company's ability to raise cash for the deal. However, all three concerns may also be overdone. Physical gold doesn't look nearly as weak as its $200 per ounce drop since Election Day would indicate. A number of interest-bearing assets are still yielding real money losses, and the Federal Reserve's benchmark lending rate is just 0.75%. The opportunity cost of owning gold is still relatively low compared to interest-based assets, and that should continue to bode well for gold. Not to mention, the uncertainties surrounding Trump's tax and economic plans could make gold a safe-haven play once again in 2017. While African miners do generally have higher labor costs and political risks, Sibanye Gold has done a good job of mitigating these risks and keeping its AISC forecast for the year very close to $1,000 an ounce as of its third-quarter report. In other words, there's still a healthy margin for Sibanye to work with, and there are levers to pull to reduce its costs, if needed. Finally, the Stillwater Mining acquisition is expected to be immediately accretive to Sibanye Gold. Stillwater operates two platinum group metal mines, but it's the company's recycling operations (namely its catalyst recycling business) that provide even greater annual cash flow. The deal is also beneficial because it gives Sibanye access to palladium, which has risen in value at a substantially faster rate than gold or platinum in 2016. With a single-digit forward P/E and dividend yield of around 5.5%, Sibanye Gold has what it takes to raise some eyebrows among income seekers in January. Neha Chamaria (Brookfield Property Partners): Brookfield Property Partners' strength as a dividend stock lies in its ability to generate steady cash flows thanks to its business model. Brookfield buys real estate properties such as offices, malls, hospitality, and multifamily buildings and leases them out for long terms. For perspective, its office portfolio consists of 149 premier properties across the globe, of which 91% has been leased for an average term of eight years. So Brookfield not only secures earnings under its lease terms for fairly long periods, but also enjoys upside rent potential. Most of the time, the company also upgrades and revamps the buildings to maximize returns. In the third quarter, it signed new leases for office properties at average rents almost 17% higher than expiring leases. 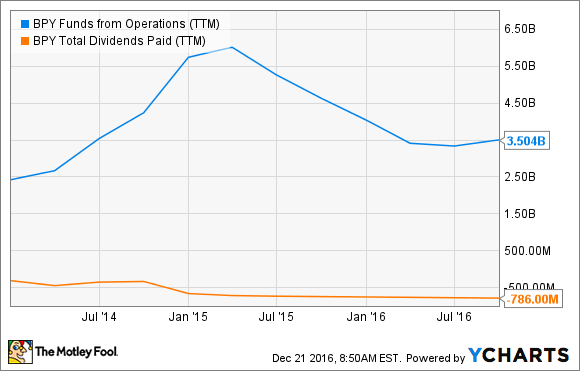 For dividend investors, what's important is that Brookfield's funds from operations (FFO) grew 17% during the first nine months of the year. FFO gives a true picture of the cash flows of real estate entities by adjusting depreciation on assets which has to be accounted for in books but isn't really an expense. In other words, FFO reveals whether a company is earning enough cash to cover its dividends. Brookfield is playing it safe. Going forward, Brookfield is targeting return on equity of 12%-15%, FFO growth per unit of 8%-11%, and annual distribution (dividend) growth of 5%-8%, presenting income investors with a lucrative investment opportunity. With the stock down almost 10% in the past six months, trading at under seven times trailing earnings, and offering 5% in dividend yield, this looks like a great time to add Brookfield to your dividend portfolio.